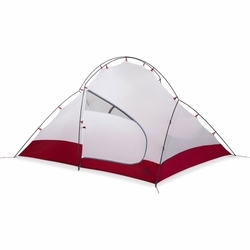 MSR Access 3 Tent. The Access 3 tent lets you spend comfortable days in the winter backcountry without hauling around the weight of a large mountaineering tent. Warm, light and strong, this four-season tent provides the protection that skiers, splitboaders and snowshoers need for camping in less severe conditions, such as those near tree-line. The robust frame withstands overnight snow loading, and is quick to set up in the cold. Whether your party is base camping to access powder lines or completing a multiday traverse, the Access 3 tent is warm enough for cold winter nights, yet light enough to keep you nimble while on the move.